A 55-year old, right-handed, Libyan man was referred to our center with complaints of progressive numbness, paraesthesia and weakness in both hands and feet as well as gait disturbance over a 3-year period. He reported a 30 kg weight loss, with irregular episodes of constipation or diarrhea during this period. His father had suffered from gait difficulty and had expired while he was around 60 years old. Of his five siblings, his two sisters suffered from cardiac disorders. His clinical examination revealed a distal symmetric tetraparesis, more pronounced in the upper extremities with bilateral thenar atrophy, absence of tendon reflexes, and a long-segment glove-and- stocking sensory loss. The plantar reflex was flexor on both the sides. During his hospitalization period, orthostatic hypotension was observed. 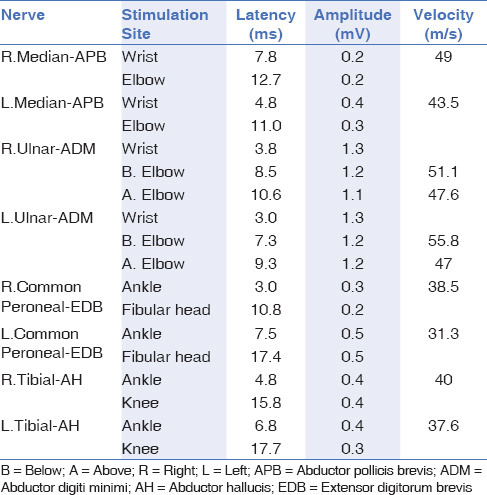 An electrophysiological examination indicated severe motor and sensory axonal neuropathy and severe bilateral carpal tunnel syndrome [Table 1] and [Table 2]. Routine blood and urinary examinations, hepatitis markers, thyroid hormones, antihuman immunodeficiency virus antibodies, and tumor markers were within normal limits. The cerebrospinal fluid protein level was mildly increased (48 mg/dL) without the presence of any cells. The results of antinuclear antibodies, anti-double strength DNA antibodies, perinuclear antineutrophil cytoplasmic antibodies, cytoplasmic antineutrophil cytoplasmic antibodies, anti-Sjögren's-syndrome-related antigen A and B autoantibodies, and anti-systemic scleroderma-70 antibodies in the blood tests were negative. Serum angiotensin converting enzyme level (7.4 U/L) was within normal limits. Screening for antiganglioside antibodies and paraneoplastic antibodies were normal. The fundus examination showed no vitreous opacity. Echocardiogram showed concentric thickening of bilateral cardiac ventricular system suggestive of a restrictive cardiomyopathy. The TTR gene analysis was performed as TTR-FAP was suspected because of the presence of sensory motor axonal neuropathy superimposed on bilateral carpal tunnel syndrome without an identifiable etiology, as well as the presence of autonomic involvement, weight loss, and cardiomyopathy. Genetic analysis revealed a heterozygous G to T change at nucleotide 418 resulting in alanine-to-serine substitution (p. Ala140Ser). 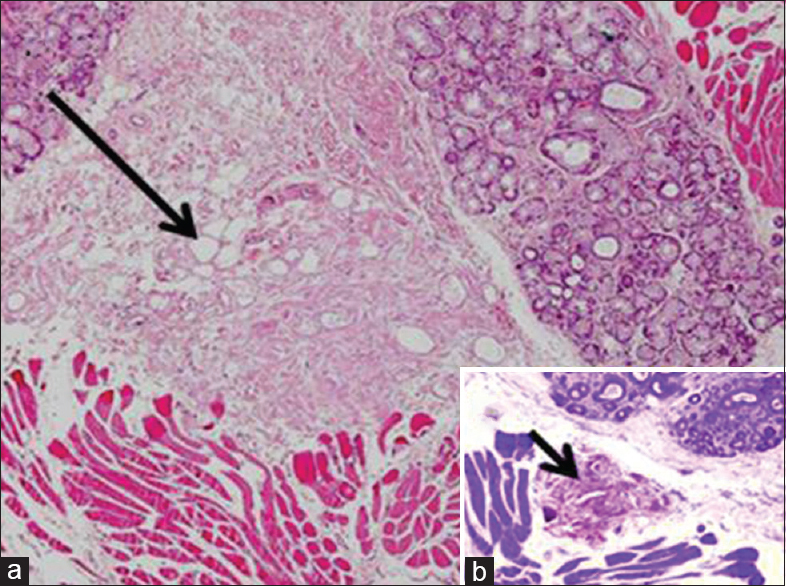 A biopsy of the salivary glands was performed and stained with hematoxylin-eosin and crystal violet; it disclosed amyloid deposits [Figure 1]. The patient was diagnosed as having TTR-FAP. Heterozygous mutation of p. Ala140Ser that we defined in our patient is reported very rarely. One of the cases reported in the literature, having the onset of clinical presentation at the age of 62 years, who was suffering from neuropathy and cardiomyopathy, was from the same ethnic origin (of Afro-Caribbean descent), similar to our patient. Another reported patient was an Italian woman with her onset of symptoms at 64 years and with nerve conduction study findings consistent with severe carpal tunnel syndrome. She also had axonal polyneuropathy with manifestations of autonomic disturbances, dominated by gastrointestinal symptoms and cachexia [Table 3]. Novel therapeutic interventions are evolving to change the natural history of TTR-FAP. Liver transplantation has been used to eliminate mutant TTR synthesis for an early-stage disease. Ericzon et al., reported a 55. 3% survival rate after liver transplantation in this condition in a 20-year retrospective study. In patients with renal or cardiac symptoms, a combined kidney-liver or heart- transplantation may be recommended. With the development of newer treatment alternatives, liver transplantation is no longer the only therapeutic choice. Mutant TTR stabilizers, including tafamidis and diflunisal and the gene-silencing strategies with antisense oligonucleotides and small interfering RNA (siRNA), are the evolving therapeutic strategies. Tafamidis is indicated in Europe for the treatment of TTR amyloidosis in ambulatory patients with mild symptomatic polyneuropathy that is limited to the lower limbs. Diflunisal is a nonsteroidal anti-inflammatory drug. A randomized, double-blind, placebo-controlled study showed reduction in the rate of progression of neurological impairment score in patients receiving diflunisal. siRNA can inhibit the synthesis of misfolding protein by the direct sequence-specific degradation of mRNA. Results of phase 2 open-label extension (OLE) study of patisiran, an investigational siRNA, showed improvement in the mean neuropathy impairment score (mNIS) with a mean 7.0-point decrease in the mNIS+7 at 24 months. A phase III trial is on-going to evaluate the efficacy and safety of IONIS-TTR treatment (Ionis Pharamceuticals Incorporated, CA, USA), an antisense oligonucleotide that is effective in TTR-FAP. Diagnostic delays and misdiagnosis of TTR-FAP are the obstacles to appropriate treatment. TTR-FAP should be suspected in patients with progressive length-dependent axonal neuropathy, autonomic neuropathy, progressive weight loss, and cardiac involvement of undetermined etiology. Genetic testing should be considered for the accurate diagnosis of this treatable life-threatening disease. Parman Y, Adams D, Obici L, Galán, Guergueltcheva V, Suhr OB, et al. European Network for TTR-FAP(ATTReuNET) Sixty years of transthyretin familial amyloid polyneuropathy (TTR-FAP) in Europe: where are we now? A European network approach to defining the epidemiology and management patterns for TTR-FAP. Current Opinion in Neurology, 29(Suppl 1), S3-13. Adams D, Suhr OB, Hund E, Obici L, Tournev I, Campistol JM, et al. First European consensus for diagnosis, management, and treatment of transthyretin familial amyloid polyneuropathy. Curr Opin Neurol 2016;29:S14-26. Planté-Bordeneuve V, Said G. Familial amyloid polyneuropathy. Lancet Neurol 2011;10:1086-97. Lachmann HJ, Booth DR, Booth SE, Bybee A, Gilbertson JA, Gillmore JD, et al. Misdiagnosis of hereditary amyloidosis as AL (primary) amyloidosis. N Engl J Med 2002;346:1786-91. Luigetti M, Conte A, Del Grande A, Bisogni G, Madia F, Lo Monaco M, et al. TTR-related amyloid neuropathy: Clinical, electrophysiological and pathological findings in 15 unrelated patients. Neurol Sci 2013;34:1057-63. Ericzon BG, Wilczek HE, Larsson M, Wijayatunga P, Stangou A, Pena JR, et al. Liver transplantation for hereditary transthyretin amyloidosis: After 20 years still the best therapeutic alternative? Transplantation 2015;99:1847-54. Okamoto S, Zhao Y, Lindqvist P, Backman C, Ericzon BG, Wijayatunga P, et al. Development of cardiomyopathy after liver transplantation in Swedish hereditary transthyretin amyloidosis (ATTR) patients. Amyloid 2011;18:200-5. Berk JL, Suhr OB, Obici L, Sekijima Y, Zeldenrust SR, Yamashita T, et al. Repurposing diflunisal for familial amyloid polyneuropathy: A randomized clinical trial. JAMA 2013;310:2658-67. Adams D, Coelho T, Conceicao I, Waddington Cruz M, Schmidt H, Buades J, et al. Phase 2 Open-Label Extension (OLE) Study of patisiran, an investigational RNAi therapeutic for the treatment of polyneuropathy due to hereditary ATTR (hATTR) amyloidosis: Final 24-month data 2017. Available from: http://www.alnylam.com/web/assets/ISA-2016_Correlation_070116.pdf. [Last accessed on 2017 Dec 01]. IONIS Pharmaceuticals. Efficacy and safety of IONIS-TTR Rx in famililal amyloid polyneuropathy. ClinicalTrials gov. www.clinicaltrials.gov/ct2/show/NCT01737398.